We had another cooking lesson with Ira and this time we learned to make green borscht. You may be familiar with Borscht as an Eastern European soup made with beets. What you might not know about is it's non-beet counterpart - Green Borscht. I can't believe I'm admitting this, but I've had 4 bowls of it already. It's so good it's really hard to stop! 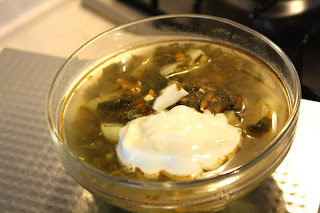 The main ingredient in green borscht is sorrel. Before this, I had maybe heard of it once or twice, but I really had no idea what it was... or how good it is! It looks a little like spinach - that's actually what I thought it was at first. The flavor however, is bright and lemony-tart, and oh-so-refreshing on a hot summer's day. Since I've never looked for it before now, I don't know how widely available it is. If you can manage to get your hand on it, definitely try it - it's so delicious, and can be used for all kinds of things (soups, salads, quiches, etc). If you can't find it, a good substitute for this equal parts of spinach and endive along with some lemon juice. In a large soup pot, cover potatoes with water and about 2 Tbsp salt and bring to a boil. As the potatoes boil, be sure to skim off any of the white foam that develops. Once the potatoes are boiling, add the four eggs to make hard-boiled eggs. (Be sure to wash the shells thoroughly - you know where eggs come from and you don't want that in your soup! As a side-note, you can also cook the eggs in a separate pot of water if you feel better about doing that.) Cook the eggs for 7-10 minutes and then remove from the soup, peel, and chop into bite-sized chunks. Continue to cook the potatoes until fork-tender. Note the difference in these pics - the one on the right has tomato paste added. There really isn't very much. "Just enough," as we were told. Serve with a dollop of Smetana (sour cream), bread, and tomato cucumber salad.